The giant retail mall operator, Westfield, is being purchased by French property giant Unibail-Rodamco, to remain resilient in the face of the changing retail market. High-end markets remain their target. Agility and diversity will be key for retailers and their employees who continue to bear the burden of the changing retail climate. 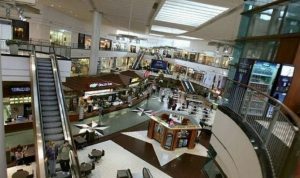 Communities that promote mixed-use mall repairs may have a chance to combat the sliding economy. The Lowy family will retain control of Westfield’s retail technology platform, OneMarket, which will be spun off into a new company on the ASX, with Steven Lowy remaining as chairman. Westfield Corporation runs 45 shopping centres and airport retail precincts in the US, UK and Italy, including the retail space in the new World Trade Centre in New York. Retailers across the United States are in what appears to be terminal decline as shoppers abandon traditional bricks and mortar while the digital revolution lays waste to traditional shopping. That, in turn, has begun to harm shopping malls as retailers have struggled to pay rents with many closing down their outlets. Thousands of mall-based stores have shut their doors across the US this year, including stalwarts such as JC Penney, Macy’s, Sears and K-Mart reducing their physical footprint. That, in turn, has begun to affect employment. Until as recently as two years ago, shopping malls were providing America with 200,000 extra jobs a year, but that trend has now suddenly reversed. According to the latest Bureau of Labour Statistics, the retail industry has lost an average of 9,000 jobs a month this year. This time last year, malls provided jobs growth of around 17,000 a month. 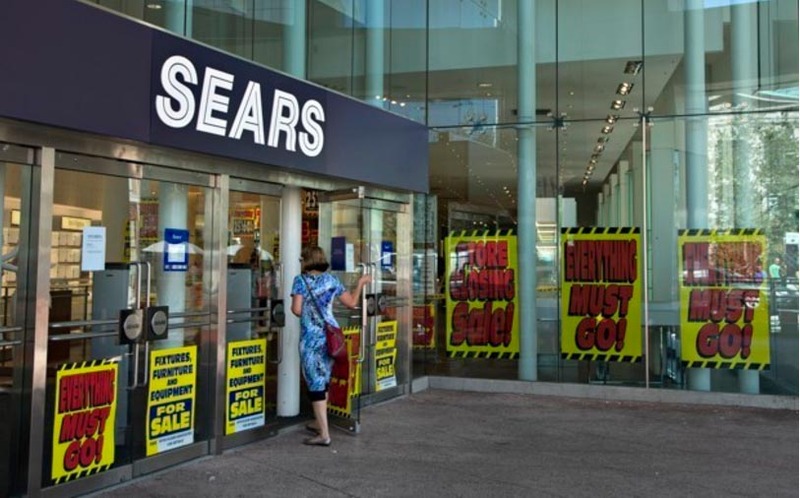 A customer enters the closing down Sears store is shown in downtown Vancouver. 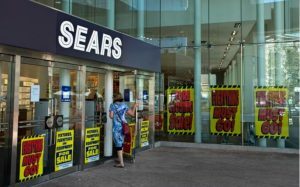 Derek Thompson’s article for CITYLAB describes the rise and fall of Sears, and a cautionary tale for Amazon. 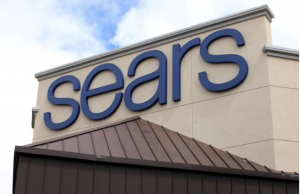 As the retail climate continues to shift, Sears’ properties, along with real estate holdings liberated by Macy’s and others during the retail meltdown, offer prime opportunities for sprawl repair that can lead to complete and walkable communities. “There are four broad lessons that Amazon can glean from the story of Sears’s decline. First, retail is in a state of perpetual metamorphosis. Second, even large technological advantages for retailers are fleeting. Third, there is no strategic replacement for being obsessed with people and their behavior. Finally, adding more businesses is not the same as building a better business. 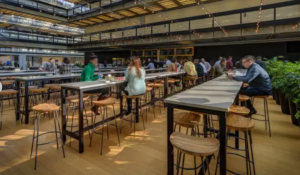 Like retail, it is important to be agile and creative in designing new communities and repairing suburban sprawl to meet the changing needs of Millennials and Baby Boomers. German grocers Aldi and Lidl are aggressively growing their U.S. footprint. 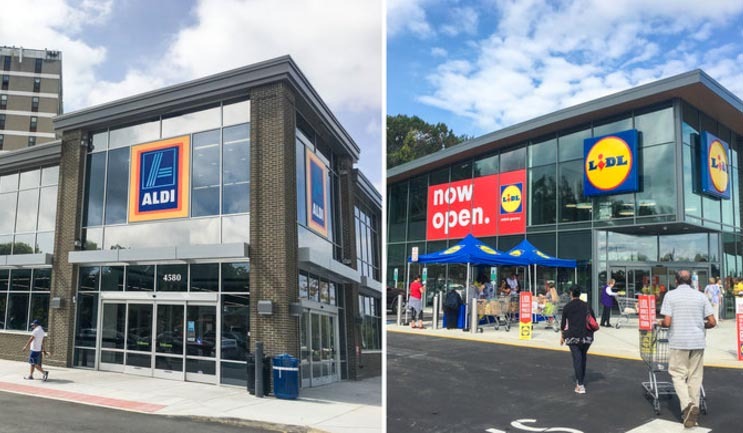 Aldi, which aims to have 2,500 stores by 2022, has recently renovated this store (left) in Alexandria, Va. And Lidl’s new location in Manassas, Va., was its 30th in the country. “Both [Aldi and Lidl] stores are known particularly for private-brand, or store-label, products. Jim Hertel, senior vice president at food retail consultancy Inmar Willard Bishop Analytics, says that allows these grocers to offer customers savings of about 35-40 percent compared with other supermarkets. A limited stock goes into these discount stores, which are very compact and value efficiency above frills. A recent study by economists Enrico Berkes of Northwestern University and Ruben Gaetani of the University of Toronto Rotman School cracks the proverbial code on the geography of innovation. They find that while there is actually a greater amount of innovation (as measured by patents) in suburbs, cities produce far more “unconventional innovations,” which require a greater diversity of contributors and have a more disruptive economic impact. Unconventional patents are more likely to come from smaller companies, university labs, or independent inventors than large, publicly-traded companies. And they are often the harbingers of revolutionary new technologies. In other words, density plays a much bigger and more important role in the type of innovation than in the rate of innovation. Large cities not only have deep pools of talent and a critical mass of specialists, they also have the density to forge connections between people and firms with diverse bases of knowledge. Ultimately, the better way to think about the geography of innovation is not city versus suburb but city and suburb. 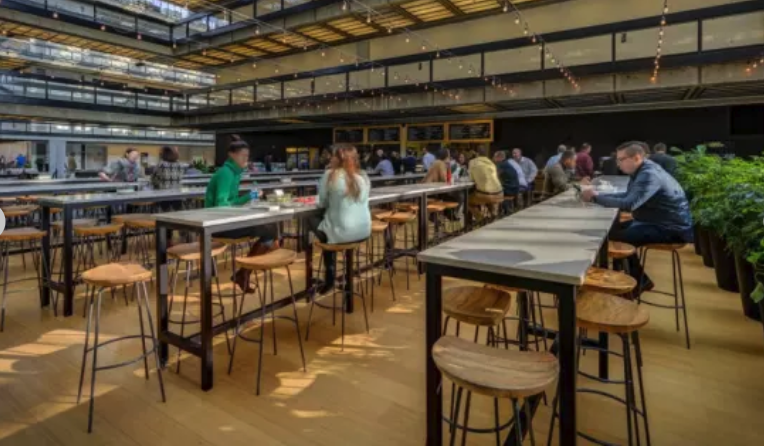 If cities are the centers for more cutting-edge innovation, the suburbs remain home to the big established companies that require large campuses to house their activities and people, and which tend to engage in a lot of patenting. It will be interesting to track these trends in the coming years, as big companies seek to urbanize their suburban campuses. Chris Sikich discusses plans to insert mixed uses, including, residential and retail development similar to Carmel’s downtown, into the state’s second largest commercial hub along US 31. When Carmel Mayor Jim Brainard looks at the 5-mile stretch of highway, he doesn’t just see multistory corporate headquarters and health care complexes that have been so instrumental in building the city’s financial base. He says there are hundreds of acres of underused land, not just the few tracts of green space on the market, but also the seas of parking lots that serve the buildings. As Carmel has developed its urban core, several high-profile corporations have fled the U.S. 31 corridor for the more walkable environment being created in the city’s downtown area. He thinks the highest quality development comes from public-private partnerships. He wants to guide development as he has in Carmel’s urban core. He hopes to offer incentives to encourage the development of shops, restaurants, homes and public spaces. That most likely means using TIF districts to pay back city bonds for parking garages, which in the past have cost from $10 million to $20 million each. 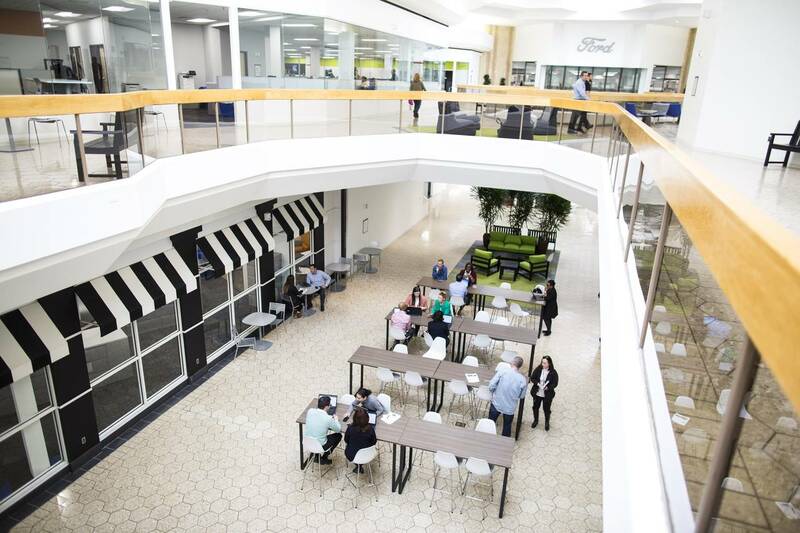 PHOTO: FORD LAND At Fairlane Town Center in Dearborn, Mich., Starwood Capital brought in Ford, which converted a former department store into a workspace for its engineering and purchasing staff. Galina Tachieva: Occupy Wall Street? Occupy the Unoccupied . . . Occupy Sprawl! As thousands cram into the winding streets and public spaces of lower Manhattan in a revolt against the “corporate forces of the world,” Galina Tachieva would really prefer protesters take over an abandoned Walmart parking lot instead. She’d really prefer we occupy sprawl viagra paypal. One of my personal heroes, Tachieva is a partner at Duany Plater-Zyberk & Company, Architects and Town Planners (DPZ), Miami, and author of the Sprawl Repair Manual. She specializes in suburban retrofits—revamping automobile-oriented, sprawling regions into more lively, sustainable, and compact communities.